Ksitigarbha (Sanskrit Kṣitigarbha, Chinese: 地藏; pinyin: Dìzàng; Japanese: 地蔵; rōmaji: Jizō) is a bodhisattva primarily revered in East Asian Buddhism and usually depicted as a Buddhist monk. His name may be translated as "Earth Treasury," "Earth Store," "Earth Matrix," or "Earth Womb." Ksitigarbha is known for his vow to take responsibility for the instruction of all beings in the six worlds between the death of Gautama Buddha and the rise of Maitreya, as well as his vow not to achieve Buddhahood until all hells are emptied. He is therefore often regarded as the bodhisattva of hell-beings, as well as the guardian of children and patron deity of deceased children and aborted fetuses in Japanese culture, where he is known as Jizō or Ojizō-sama. 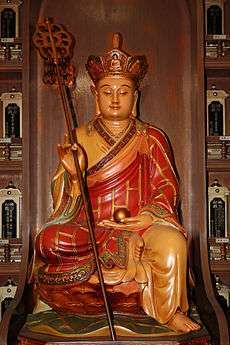 Ksitigarbha is one of the four principal bodhisattvas in East Asian Mahayana Buddhism. The others are Samantabhadra, Manjusri, and Avalokiteśvara. 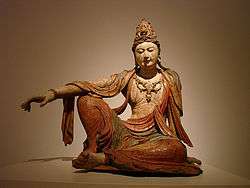 At the pre-Tang dynasty grottos in Dunhuang and Longmen, he is depicted in a classical bodhisattva form. After the Tang, he became increasingly depicted as a monk carrying Buddhist prayer beads and a staff. His full name in Chinese is Dayuan Dizang Pusa (Chinese: 大願地藏菩薩; pinyin: Dàyuàn Dìzàng Púsà), or "Bodhisattva King Kṣitigarbha of the Great Vow," pronounced Daigan Jizō Bosatsu in Japanese and Jijang Bosal in Korean. This name is a reference to his pledge, as recorded in the sutras, to take responsibility for the instruction of all beings in the six worlds in the era between the parinirvana of the Buddha and the rise of Maitreya. Because of this important role, shrines to Ksitigarbha often occupy a central role in temples, especially within the memorial halls or mausoleums. Ksitigarbha (or in Japanese, Jizo) statue at Mt. Osore, a location said to resemble children's limbo in Japanese Buddhist tradition. There, Jizo is said to appear to rescue the children from the limbo and its iron club-welding demons. Because of this, Jizo statues are often adorned with bibs, kerchiefs (pictured) and haori. In Jizo's right hand, he carries a khakkhara monk staff, and in his left, a wish-fulfilling jewel. The story of Ksitigarbha was first described in the Kṣitigarbha Bodhisattva Pūrvapraṇidhāna Sūtra, one of the most popular Mahāyāna sūtras. This sutra is said to have been spoken by the Buddha towards the end of his life to the beings of the Trāyastriṃśa Heaven as a mark of gratitude and remembrance for his beloved mother, Maya. The Kṣitigarbha Bodhisattva Pūrvapraṇidhāna Sūtra was first translated from Sanskrit into Chinese between 695-700 CE, during the Tang dynasty, by the Tripiṭaka master Śikṣānanda, a Buddhist monk from Khotan who also provided a new translation of the Avataṃsaka Sūtra and the Laṅkāvatāra Sūtra. However, some scholars have suspected that instead of being translated, this text may have originated in China, since no Sanskrit manuscripts of this text have been found. Part of the reason for suspicion is that the text advocates filial piety, which was stereotypically associated with Chinese culture. It stated that Ksitigarbha practised filial piety as a mortal, which eventually led to making great vows to save all sentient beings. Since then, other scholars such as Gregory Schopen have pointed out that Indian Buddhism also had traditions of filial piety. Currently there is no definitive evidence indicating either an Indian or Chinese origin for the text. In the Kṣitigarbha Sūtra, the Buddha states that in the distant past eons, Ksitigarbha was a maiden of the Brahmin caste by the name of Sacred Girl. She was deeply troubled when her mother died, because she had often been slanderous towards the Three Jewels. To save her from the great tortures of hell, the girl sold whatever she had and used the money to buy offerings that she offered daily to the Buddha of her time, known as the Buddha of the Flower of Meditation and Enlightenment. She prayed fervently that her mother be spared the pains of hell and appealed to the Buddha for help. While she was pleading for help at the temple, she heard the Buddha telling her to go home, sit down, and recite his name if she wanted to know where her mother was. She did as she was told and her consciousness was transported to a Hell realm, where she met a guardian who informed her that through her fervent prayers and pious offerings, her mother had accumulated much merit and had already ascended to heaven. Sacred Girl was greatly relieved and would have been extremely happy, but the sight of the suffering she had seen in Hell touched her heart. She vowed to do her best to relieve beings of their suffering in her future lives for kalpas. There is a legend about how Ksitigarbha manifested himself in China and chose his bodhimaṇḍa to be Mount Jiuhua, one of the Four Sacred Mountains of China. During the reign of Emperor Ming of Han, Buddhism started to flourish, reaching its peak in the Tang and eventually spreading to Korea. At the time, monks and scholars arrived from those countries to seek the dharma in China. One of these pilgrims was a former prince from Silla named Kim Gyo-gak, who became a monk under the Chinese name Dizang "Ksitigarbha," pronounced Jijang in Korean. He went to Mount Jiuhua in present-day Anhui. After ascending, he decided to build a hut in a deep mountain area so that he could cultivate the dharma. According to records, Jijang was bitten by a poisonous snake but he did not move, thus letting the snake go. A woman happened to pass by and gave the monk medicines to cure him of the venom, as well as a spring on her son's behalf. For a few years, Jijang continued to meditate in his hut, until one day, a scholar named Chu-Ke led a group of friends and family to visit the mountain. Noticing the monk meditating in the hut, they went and took a look at his condition. They had noticed that his bowl did not contain any food, and that his hair had grown back. Taking pity on the monk, Chu-Ke decided to build a temple as an offering to him. The whole group descended the mountain immediately to discuss plans to build the temple. Mount Jiuhua was also property of a wealthy person called Elder Wen-Ke, who obliged to build a temple on his mountain. Therefore, Wen-Ke and the group ascended the mountain once more and asked Jijang how much land he needed. Jijang replied that he needed a piece of land that could be covered fully by his kasaya. Initially believing that a piece of sash could not provide enough land to build a temple, they were surprised when Jijang threw the kasaya in the air, and the robe expanded in size, covering the entire mountain. Elder Wen-Ke had then decided to renounce the entire mountain to Jijang, and became his protector. Sometime later, Wen-Ke's son also left secular life to become a monk. Jijang lived in Mount Jiuhua for 75 years before passing away at the age of 99. Three years after his nirvana, his tomb was opened, only to reveal that the body had not decayed. Because Jijang led his wayplace with much difficulty, most people had the intuition to believe that he was indeed an incarnation of Ksitigarbha. Jijang's well-preserved, dehydrated body may still be viewed today at the monastery he built on Mount Jiuhua. In Buddhist iconography, Ksitigarbha is typically depicted with a shaven head, dressed in a monk's simple robes (unlike most other bodhisattvas, who are dressed like Indian royalty). In his left hand, Ksitigarbha holds a cintamani; in his right hand, he holds a staff (called shakujo 錫杖 in Japanese), which is used to alert insects and small animals of his approach, so that he will not accidentally harm them. This staff is traditionally carried by Buddhist monks. In the Chinese tradition, Ksitigarbha is sometimes depicted wearing a crown like the one worn by Vairocana. His image is similar to that of the fictional version of Xuanzang from the classical novel Journey to the West, so observers sometimes mistake Ksitigarbha for the latter. Like other bodhisattvas, Ksitigarbha usually is seen standing on a lotus base, symbolising his release from rebirth. Ksitigarbha's face and head are also idealised, featuring the third eye, elongated ears and the other standard attributes of a buddha. Jizō bodhisattva statue at Mibudera temple in Japan, depicted with children and bibs. Tōsen-ji in Katsushika, Tokyo, contains the "Bound Jizō" of Ōoka Tadasuke fame, dating from the Edo period. When petitions are requested before Jizō, the petitioner ties a rope about the statue. When the wish is granted, the petitioner unties the rope. At the new year, the ropes of the ungranted wishes are cut by the temple priest. The vandalism of a Jizō statue is the central theme of the Japanese horror film Shibuya Kaidan. Another category of iconographic depiction is Ksitigarbha as the Lord of the Six Ways, an allegorical representation of the Six Paths of Rebirth of the Desire realm (rebirth into hell, or as pretas, animals, asuras, men, and devas). The Six Paths are often depicted as six rays or beams radiating from the bodhisattva and accompanied by figurative representations of the Six Paths. Many of these depictions in China can be found in Shaanxi province, perhaps a result of Sanjie Jiao worship in the area. A Japanese variation of this depiction is the Six Jizo, six full sculptural manifestations of the bodhisattva. An example of this can be found in Konjikidō, the ‘Hall of Gold,’ in the Chūson-ji temple. Mount Jiuhua in Anhui is regarded as Ksitigarbha's bodhimaṇḍa. 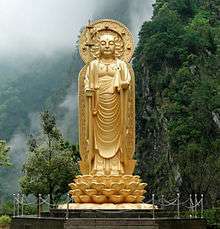 It is one of the Four Sacred Buddhism Mountains in China, and at one time housed more than 300 temples. Today, 95 of these are open to the public. The mountain is a popular destination for pilgrims offering dedications to Ksitigarbha. In some areas, the admixture of traditional religions has led to Ksitigarbha being also regarded as a Taoist deity, albeit his duties differ to what Ksitigarbha does. For example, in Hong Kong and among overseas Chinese communities, his images are usually found in the memorial halls of Buddhist and Taoist temples. Jizō statues are sometimes accompanied by a little pile of stones and pebbles, put there by people in the hope that it would shorten the time children have to suffer in the underworld. (The act is derived from the tradition of building stupas as an act of merit-making.) The statues can sometimes be seen wearing tiny children's clothing or bibs, or with toys, put there by grieving parents to help their lost ones and hoping that Jizō would specially protect them. Sometimes the offerings are put there by parents to thank Ksitigarbha for saving their children from a serious illness. His features are commonly made more baby-like to resemble the children he protects. As Ksitigarbha is seen as the saviour of souls who have to suffer in the underworld, his statues are common in cemeteries. He is also believed to be one of the protective deities of travellers, the dōsojin, and roadside statues of Jizō are a common sight in Japan. Firefighters are also believed to be under his protection. In Theravada Buddhism, the story of a bhikkhu named Phra Malai with similar qualities to Ksitigarbha is well known throughout Southeast Asia, especially in Thailand and Laos. Legend has it that he was an arhat from Sri Lanka who achieved great supernatural powers through his own merit and meditation. He is also honoured as a successor to Mahāmoggallāna, the Buddha's disciple foremost for his supernatural attainments. In the story, this pious and compassionate monk descends to Hell to give teachings & comfort the suffering hell-beings there. He also learns how the hell-beings are punished according to their sins in the different hells. 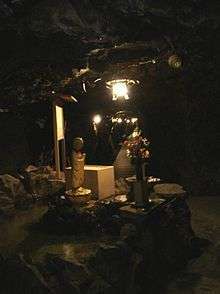 Statue of Jizō in the Toi gold mine, Shizuoka Prefecture, Japan. Om! Ha ha ha! O wondrous one! svāhā! "Be not afraid, dears! be never fearful! Poor little souls, your lives were brief indeed! The long journey to the region of the dead! Father of all children in the region of the dead." So graciously takes he pity on the infants. And he pets the little ones, caresses them, takes them to his loving bosom. So graciously he takes pity on the infants. ↑ Ksitigarbha Sutra - Chapter One: Miracles In The Palace Of The Trayastrimsas Heaven: - "Thus have I heard. Once the Buddha was abiding in Trayastrimsas Heaven in order to expound the Dharma to his mother." ↑ Buswell, Robert E., ed. (2014). The Princeton Dictionary of Buddhism. Princeton University Press. p. 448. ↑ Schopen, Gregory. Filial Piety and the Monk in the Practice of Buddhism: A Question of 'Sinicization' Viewed from the Other Side. 1 2 "Ti Tsang P'usa: Ksitigarbha Bodhisattva". Buddhanet.net. Archived from the original on January 3, 2012. Retrieved 2012-01-16. ↑ "释地藏金乔觉考". Fo365.cn. Archived from the original on December 9, 2011. Retrieved 2012-01-16. ↑ Zhiru (2007). 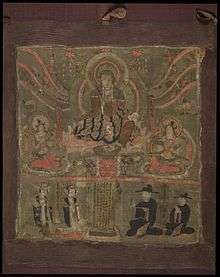 The making of a savior bodhisattva: Dizang in Medieval China ([Online-Ausg.]. ed.). Honolulu (T.H. ): University of Hawai'i press. p. 68. ISBN 0824830458. ↑ Ginsburg, Henry (2000). 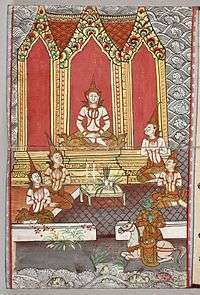 Thai art and culture : historic manuscripts from western collections. Honolulu, Hawaii: Univ. of Hawaii Press. p. 92. ISBN 978-0824823672. ↑ "Shingon Buddhism and Jizo". Shingon.org. Retrieved 2012-01-16. Bays, Jan Chozen (2002). Jizo Bodhisattva: Modern Healing and Traditional Buddhist Practice. Tuttle Pub. ISBN 978-0-8048-3189-5. Bays, Jan Chozen (2003). Jizo Bodhisattva: Guardian of Children, Travelers, and Other Voyagers. Shambhala Publications. ISBN 978-1-59030-080-0. Ng, Zhiru (2007). 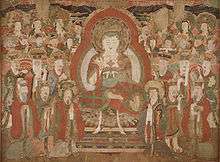 The Making of a Savior Bodhisattva: Dizang in Medieval China. University of Hawaii Press. ISBN 978-0-8248-3045-8. French, Frank G. (ed); Shi, Daoji (trans.)(2003). The Sutra of Bodhisattva Ksitigarbha's Fundamental Vows (地藏經), Sutra Translation Committee of the U.S. and Canada/The Corporate Body of the Buddha Educational Foundation Taipei, Taiwan, 2nd ed. Wikimedia Commons has media related to Ksitigarbha. Wikimedia Commons has media related to Jizo.